Occupational therapy is a science-driven, evidence-based profession that enables people of all ages to live life to its fullest by helping them promote health and prevent—or live better with—illness, injury or disability. Practitioners must complete supervised clinical internships in a variety of health care settings, and pass a national examination. Most states also regulate occupational therapy practice. In today's health care and social landscape, occupational therapy practitioners can be found in the six broad areas of practice listed below. For more information, see the fact sheets and articles that illustrate occupational therapy in action. Occupational therapy - a vibrant, growing profession - makes it possible for people to achieve independence and to enjoy life to its fullest. By choosing a career as an occupational therapy assistant, you will make a difference! You will be able to improve the lives of people, from newborns to the very old. One of the greatest advantages of a career as an occupational therapy assistant is the wide variety of opportunities available to graduates. Many occupational therapy assistants choose to help children thrive in the “occupations” of childhood - learning, playing, and growing. Some work in schools with students who have learning disabilities, behavioral problems, cerebral palsy, or Down syndrome. Occupational therapy assistants also work with individuals in their homes, community centers, rehabilitation hospitals, and nursing homes. In these settings, they help people with traumatic injuries, stroke, Alzheimer’s disease, or mental health problems learn to live productive lives through the use of meaningful occupations. If you are looking for a challenging career and have a desire to learn, achieve, and give your best to society, a career as an occupational therapy assistant is for you! The occupational therapy assistant program is accredited by the Accreditation Council for Occupational Therapy Education (ACOTE) (www.acoteonline.org) of the American Occupational Therapy Association (AOTA), located at 4720 Montgomery Lane, Suite 200, Bethesda, MD 20814-3449. ACOTE’s telephone number c/o AOTA is (301) 652-2682. 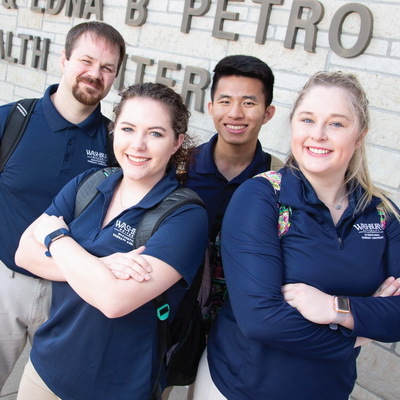 Graduates of the program will be eligible to sit for the national certification examination for the occupational therapy assistant administered by the National Board for Certification in Occupational Therapy (NBCOT). After successful completion of this exam, the individual will be a Certified Occupational Therapy Assistant (COTA). In addition, most states require licensure in order to practice; however, state licenses are usually based on the results of the NBCOT Certification Examination (www.nbcot.org). Note that a felony conviction may affect a graduate’s ability to sit for the NBCOT certification examination or attain state licensure. NOTE: Students must complete Level II fieldwork within 18 months following completion of the didactic portion of the program. * Professional behavior consistent with employer expectations as entry-level generalist occupational therapy assistants. Delivering occupational therapy services to clients, focusing on the application of purposeful and meaningful occupation. Deliver occupational therapy services to a variety of clients across the life span and to a variety of settings.